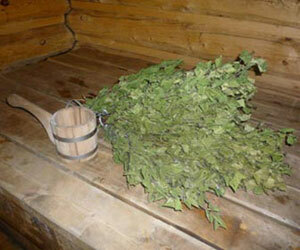 One of the oldest traditions of bathing in Russia is to use birch broom. In the sweating room such broom beat each other and catching up heat on bunk. - A broom also serves as a "fan" that even more injects heat in the sweating room. Unfortunately, for reasons of fire safety, the use of brooms in our sauna is not welcomed.